Grandma Vedders, Uncle Brad, Aunt Meghan, Hayley, Jamie, Sydney, Greg, Nate, Zach an d myself all spent the afternoon at the circus!! 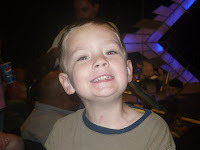 Ringling Bros, and Barnum & Bailey performed at the VanAndel Area, in Grand Rapids. 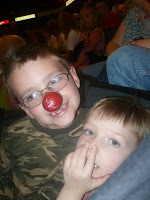 The kids enjoyed the preshow where they each received a clown nose. Zach was excited when mommy received marshmellows from one of the clowns. They threw them up in the audience!! 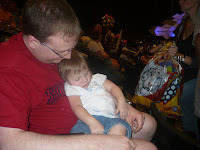 Jamie's favorite part of the circus seemed to be when she fell asleep in daddy's arms. 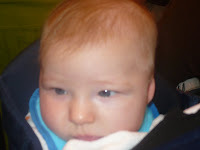 Grandma and I watched in amazement as she slept through all the noise!! Syney watched the preshow from her "kangaroo pouch". 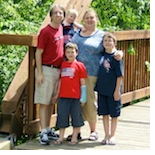 All in all we had a great time at the circus!